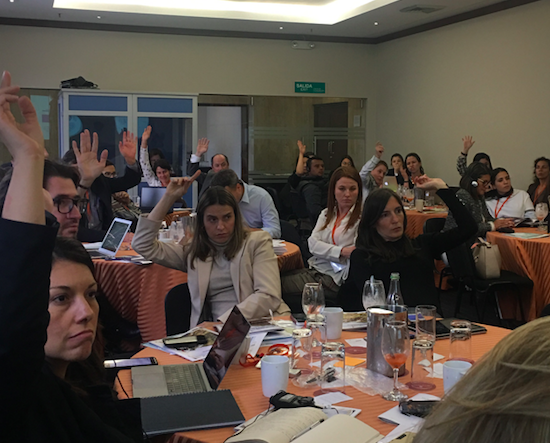 Over 60 foundations, mostly members of AFE Colombia (AFE) participated in a workshop on the Theory of the Foundation and Scaling Solutions for greater impact prepared jointly by Rockefeller Philanthropy Advisors (RPA), AFE and United Nations Development Programme (UNDP). 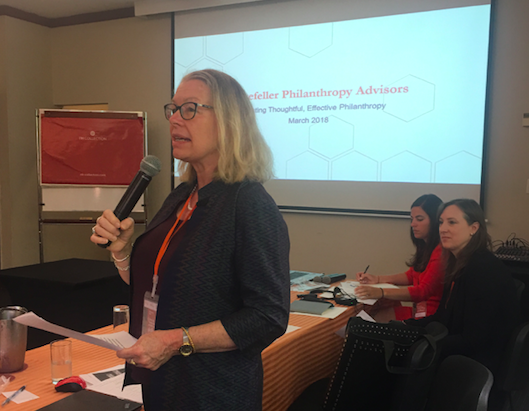 During the first day, Heather Grady, Donzelina Barroso and Lily Papakhian from RPA explained how foundation leaders might think about their organizations beyond their programs and in the context of broader social impact. A combination of presentations of the latest RPA research and insights from working with philanthropic clients all over the world, group exercises and discussion aimed to enhance capacities of the foundations to effectively align their resources for the impact they have envisioned. The second day featured work on the Scaling Solutions initiative which RPA has been doing jointly the Skoll, Porticus, Ford, and Draper Richards Kaplan Foundations and exploring how to encourage funders to work in more collaborative ways to place longer-term, adaptive, and responsive resources with grantees and investees to accelerate scalable solutions that target systemic changes addressing pressing global problems. The Scaling Solutions conceptual model is linked with the SDGs which present the largest and intractable challenges that our humanity and individual societies face today. The group dived deeply analyzing and discussing how collaboration, building on the Collaborative Pathways flagship approaches used in the SDG Philanthropy Platform, can help to enhance impact and think in much larger national or regional frame. 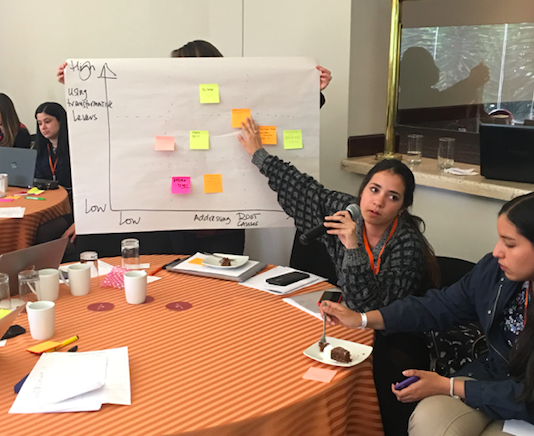 Participants used the approach to analyze and model their own work against the SDGs and systems thinking, to create pathways for bigger scale and transformative partnerships. Felipe Castro, Director of Monitoring, Evaluation and Public Policy in the government of Colombia presented the recently adopted national SDGs indicators as well as a groundbreaking portal to track progress on the SDGs in Colombia which was launched earlier in March by Colombia’s President Juan Manuel Santos. The portal helps citizens monitor progress on the goals and targets by 2030 and help all actors in the society get engaged in the 2030 Agenda. The lively discussion that followed Mr. Castro presentation demonstrated that localizing the SDGs through the national indicators, visualization of progress through maps like the one in Colombia can quickly gain traction and enthusiastic engagement of the local actors because it translates global goals into local actions and situations. The two days workshop was great opportunity to enhance trust between various players working on development in Colombia around thinking how the collaboration and bigger picture thinking can enhance the collective as well as the individual impact on the specific development challenges. To those who attended a workshop in Bogotá, Colombia, you can download the powerpoint here. In order to download the powerpoint, please log in your SDGPP account. If you do not have an account, you can create your account here.